string(1097) "Resource Centre > Uncategorized > 2018 Food and Beverage Benchmark Findings Report"
The risk of forced labor is pervasive across today’s food and beverage supply chains: from tea pickers on tea estates to crew members on fishing vessels and laborers on cattle and poultry ranches, cocoa farms, and rice mills. Workers in the agricultural sector tend to be isolated on remote farms or boats, and harder to reach than more permanent factory workers, making them particularly vulnerable to exploitation. Driven by increasing demand for fuel, food, and raw materials, the sector increasingly pushes agricultural work into more rural areas to accommodate its land-intensive activities, exacerbating the remote nature of the work. To better understand how companies are addressing the risk of forced labor occurring in their supply chains, KnowTheChain evaluated 38 of the largest global food and beverage companies on the forced labor policies and procedures that each company has in place. This report marks KnowTheChain’s second food and beverage benchmark since it was launched in 2016. 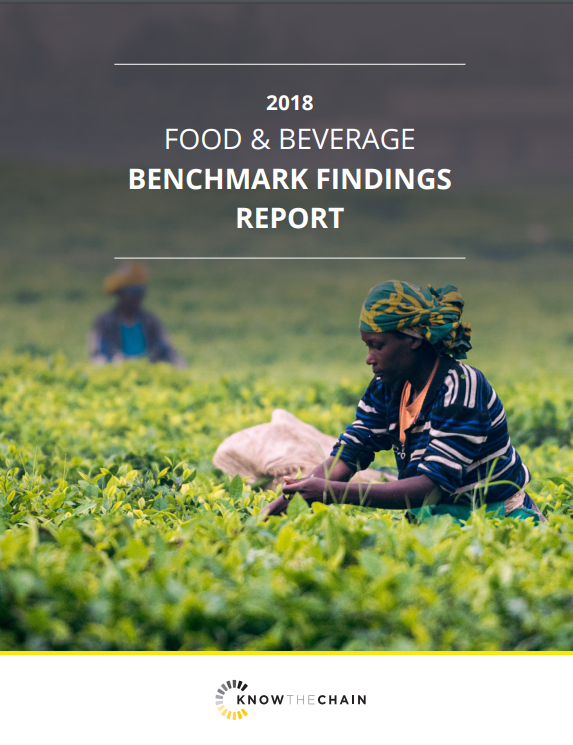 The 38 Food and Beverage companies were assessed across the benchmark’s seven themes, which were developed to capture the key areas where companies need to take action to eradicate forced labor from their supply chains: commitment and governance; traceability and risk assessment; purchasing practices; recruitment; worker voice; monitoring; and remedy. There are a total of 23 indicators across the seven themes. Each theme is weighted equally and determines the company’s overall benchmark score on a scale from 0 to 100.